We began our work week with a full-day of professional development. We focused on gaining a deeper understanding of the new District Improvement Plan and how it provides guidance for the work ahead. I also had the opportunity to present to the School Committee and to the Board of Selectmen a report containing the new courses, programs, services, and structures that the Leadership Team created for the 2018-2019 school year. All new areas included in this report are student-centered, aligned with the new District Improvement Plan, and they provide new experiences and supports to ensure that ALL students are receiving the best education we can provide. We are proud of our accomplishments and are focused on our mission to deliver world-class education today for the global leaders of tomorrow. Students and teachers at the Forest Avenue Elementary School held their second annual International Dot Day today. Based on the book by Peter H. Reynolds, International Dot Day celebrates creativity, courage, and collaboration. Students did this through classroom activities throughout the day the encouraged them to build social skills while creating art. 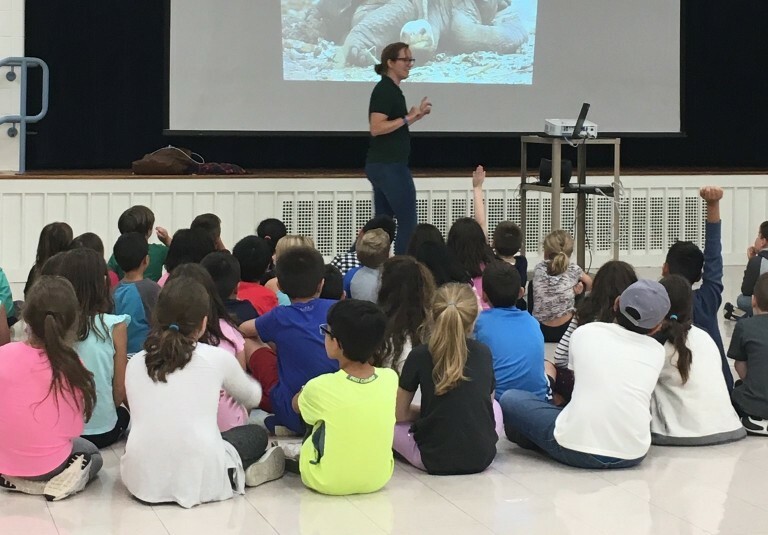 Assistant Superintendent, Kathy Provost, reads The Dot by Peter H. Reynolds to students this morning to begin the activities (middle photo). The Turtles Are Coming! The Turtles Are Coming! This month elementary students at the C.A. Farley, Forest Avenue, and J.L. Mulready Elementary schools will be receiving Blandings Turtle hatchlings to raise. Students, along with the support of the Zoo New England will be caring for these turtles in their classrooms as part of a head-starting program. These "head-started" turtles will grow much bigger in captivity increasing their chances of survival at the Assabet River National Wildlife Refuge. Students will weigh, measure, and journal about the turtles providing valuable scientific data for Zoo New England. 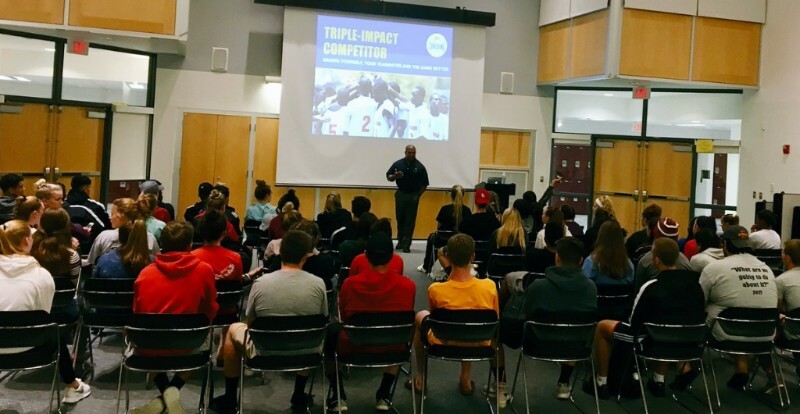 This week, athletes from Hudson High School participated in the motivational workshop Becoming a Triple-Impact Competitor as part of the Fall Positive Coaching Alliance Leadership Workshop. "This highly interactive course provides specific tips and techniques for mastery and continuous improvement in any sport, seizing opportunities to encourage and support teammates, and competing fiercely to win, but only within an ethical context of Honoring the Game." We wish all of our student-athletes a positive and rewarding season and school year. We are saddened by the news that came from the Merrimack Valley yesterday affecting residents of Andover, North Andover, and Lawrence. Our hearts go out to them all during this difficult time. Our transportation company North Reading Transporation (NRT) shared this information with us today. Please be patient if you experience any bussing delays. You can always contact them if you have any concerns. "To NRT Bus Communities - Many of NRT drivers and monitors come from the Lawrence/Merrimack Valley area and have been impacted by the devastating fires last evening. We at NRT are doing everything possible to provide support to those employees and family members in their time of need. Some routes may be running late over the next couple of days due to this tragic event. We thank you for your patience during this time. Best Regards, John McCarthy, President"
Dr. Marco C. Rodrigues, Superintendent of the Hudson Public Schools, will be hosting listening sessions for parents and guardians during the 2018-2019 school year. These listening sessions are designed to provide parents and guardians the opportunity to ask questions regarding the educational practices in the Hudson Public Schools. There will be no set topics for these sessions. If a parent or guardian has a question or concern that is private or individualized to their student, we ask that such question(s) be brought to the attention of the respective building principal. We will not discuss a student’s particular situation at these sessions. Did you know that we have some exciting new courses and pathways at the David J. Quinn Middle School? 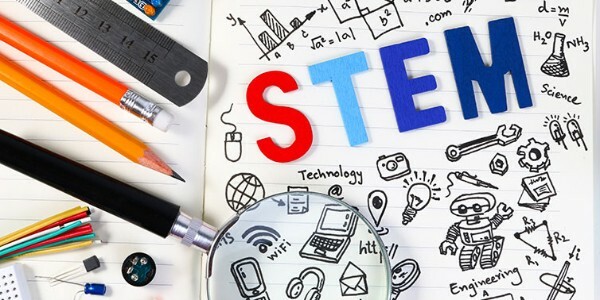 These programs include STEM and Humanities elective options and expand our program of studies for grades 5 - 7. Project Lead The Way (PLTW): App Creators, Innovators and Makers, Green Architecture, Design and Modeling, Automation and Robotics. Engineering: Wearable Electronics, Engineering for the Environment. Computer Science: Computer Science Exploration. Humanities: Current Issues in the Media, Using Social Media, I Am a Collaborator. Saturday, September 15 - Hudson Youth Substance Abuse Prevention Coalition Yard Sale from 9:00 a.m. to 1:00 p.m. at the Argeo R. Cellucci Clubhouse/Boys & Girls Club, 21 Church Street. 7:00 p.m.
Wednesday, September 19 - SEPAC Hudson Meeting - 6:30 p.m. in the Hudson High School Teachers' Loung A134. 69 Brigham Street.